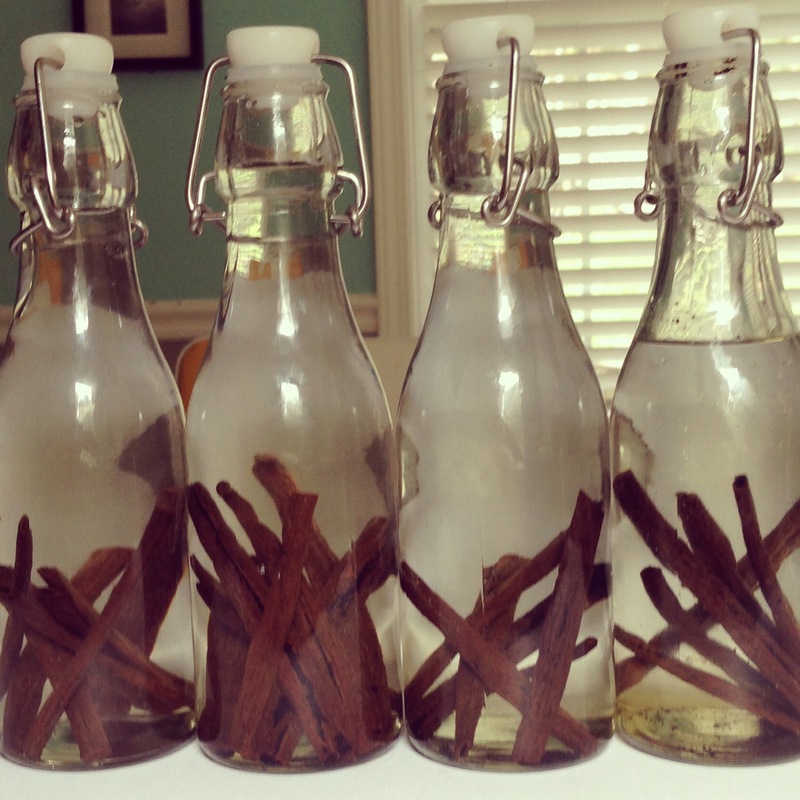 This Christmas, I made some homemade vanilla extract for gifts. I have to say, it ended up being one of my favorite gifts to give. It is unique, smells amazing, something everyone uses…and it makes an extremely cute gift. It would also be perfect for any time of year! I have seen lots of pins on pintrest for homemade vanilla extract, but I did my research at Tidy Mom. Bottles – These Wheaton Bottles from Amazon are my favorite. I did purchase some at Hobby Lobby too when they had glass 1/2 off…those are pictured below. Vanilla Beans – I purchased my vanilla beans from Olive Nation, they were on sale. There is also Beanilla. I would recommend getting them online, they are super expensive at the grocery store. Vodka – It can be the cheap stuff. Using a sharp knife, slice each vanilla bean in half. Tthen starting about 1/4″ from one end, cut the vanilla bean lengthwise. Place 6-8 vanilla bean pieces (that would be 3-4 whole beans) in each 8 ounce bottle. Using a measuring cup or funnel, pour vodka into each bottle completely covering the beans in the liquid. Next, place the lids on tightly and store bottles in a cool, dark environment. Shake them about once a week. The vanilla will be ready to use as soon as 6 weeks, and the longer you allow it to age, the darker it will become and the more intense the vanilla flavor will be. My vanilla took the entire 8 weeks, you could literally smell when it was ready! After 8 weeks the majority of the extraction process is complete and the vanilla is ready to use. The vanilla beans can be removed or you can leave the vanilla beans in the jar for the flavor to continue evolve. I remevoed the vanilla beans for most of the ones I gave as gifts. I ended up removing the beans and running the vanilla through cheese cloth just to refine it. 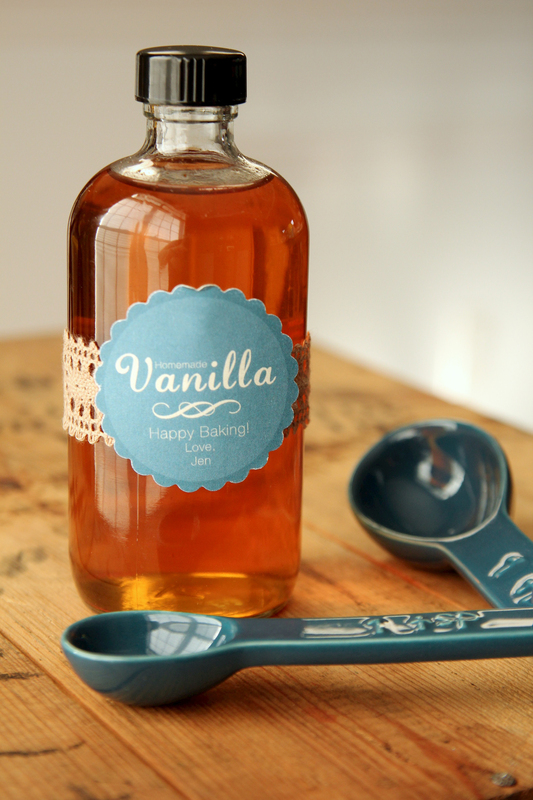 I do still have the vanilla beans in the bottle I am using in my kitchen and I love it! The price per bottle of vanilla extract comes out to around $6-8 each. I appologize for the picture quality, but this is the only one I have from the day I began the vanilla extract process…back in October. I will probably be making some more soon…if my friends and family don’t get tired of it! This entry was posted in Cute Things and tagged Homemade, Vanilla Beans, Vanilla Extract, Vodka. Bookmark the permalink.